Awards Spanish Campaign Medal, Philippine Campaign Medal, Cuban Pacification Medal, Mexican Service Medal, Navy Cross, Victory Medal World War I Service. Carl Theodore Vogelgesang, the youngest of six sons, received his education in the Stockton, California public schools. While in the Senior class of high school he was given an opportunity to enter a competitive examination for entrance into the Naval Academy at Annapolis. He won the appointment, and went on to Washington, where he was the protage of Congressman James A. Louttit of Stockton. In order to reach Annapolis in time, he was granted his high school diploma in advance. He passed the final examination at Annapolis in June, entered the Academy in 1886 and was graduated in 1890. Graduates at that time were given the privilege of remaining in the service or retiring. In answer to a letter asking his mother's advice, she said, "My son, as long as the government has given you your education, you should repay with your service." Theodore followed her advice, and never regretted his decision. He was married to Miss Zenaide Shepard, daughter of Admiral Shepard, and their children were a son, Shepard, and a daughter, Zenaide. Theodore's first command, as Lieutenant-Commander, was the USS Mayflower, in the early part of President Theodore Roosevelt's administration, serving as Captain of the President's official yacht. His next promotion was to Executive Officer on the USS Wyoming. In 1909 he was assigned to the War College at Newport, (Admirals Merrill and Rogers in command) where he taught the Science of War. In this assignment he was instrumental in working out a course of study which was adopted and is now in use. During his early career, Theodore also served on the Charleston, Alliance, Bancroft, Kentucky, Adams and Mohican. While on board the USS Celtic in 1898, he received the Spanish Campaign Medal, and in 1899 the Philippine Campaign Medal. In 1906 he received the Cuban Pacification Medal. 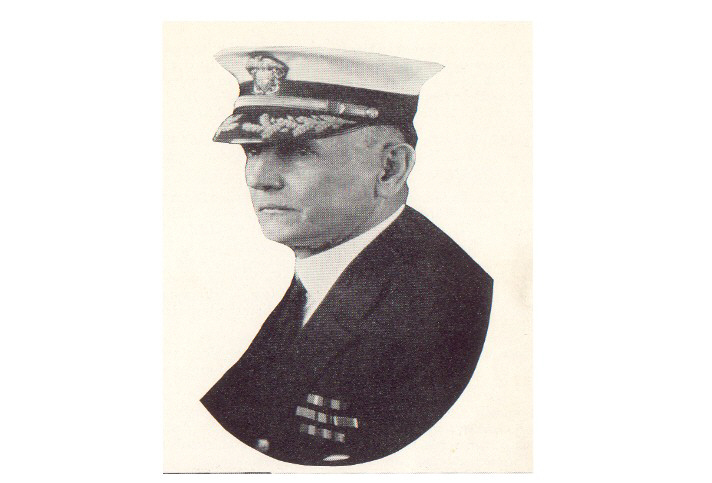 While Commander of the USS Des Moines in 1914, he received the Mexican Service Medal in recognition of the services of officers and men in quelling the uprising at Vera Cruz. 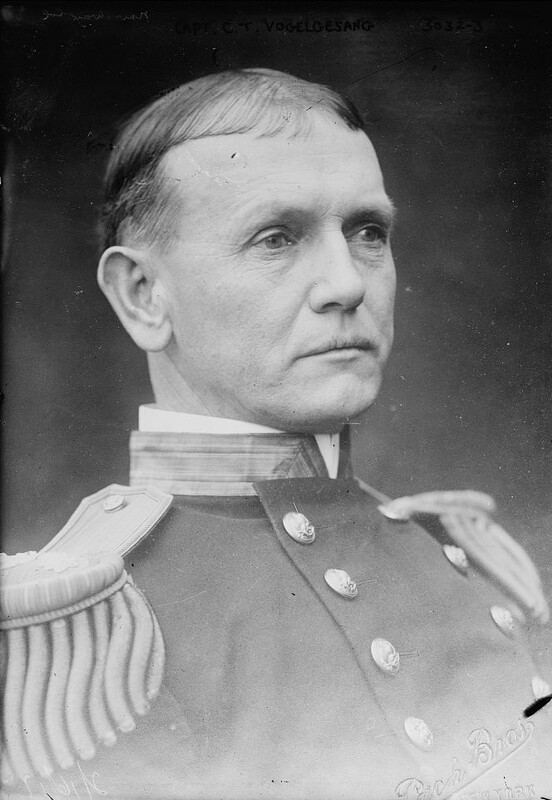 From 1914 to 1917 he was assigned to the Naval War College as Chief of Staff to Commander-in-Chief Admiral Knight. During his tour of duty he received the Navy Cross, with the following citation: "For exceptionally meritorious service in duty of great responsibility as Chief of Staff to Commander-in-Chief, U. S. Asiatic Fleet." In 1917 he received the Victory Medal, World War I Service. In 1918 he was made Senior Member of the Naval Commission to Brazil in connection with the Brazilian War College, after which he returned to the Naval War College at Newport for several months. In 1919 he reported to the New York Shipbuilding Company as Naval Inspector of Machinery, in connection with the outfitting of the USS Idaho, assuming command of the ship when she was commissioned. After one year of service on the "Idaho", in 1920, he was returned to duty as Chief of Staff of the Atlantic Fleet. In 1921 he was assigned to duty as Commandant at the New York Navy Yard, Brooklyn, and received his promotion to Rear Admiral while on this duty. In 1922 a request came to President Coolidge from the President of Brazil, asking that Admiral Vogelgesang be detached from the Third Naval District and sent to Brazil to aid in the reconstruction of the Brazilian Navy. Our government did not heed the request, because under Admiral Vogelgesang, the Navy Yard had been free from strikes and had enjoyed the best financial status in years. Consequently, the Governor of New York, senators and other prominent New Yorkers protested that the Admiral should be retained at the Navy Yard. A second request came asking for Admiral Vogelgesang, and no other; if he could not be spared Brazil would make a selection from the British Navy. The value of establishing a brotherly relationship between the United States and Brazil was recognized. The Admiral was ordered to form his Commission, and with thirty-five selected Naval Officers, proceeded to Rio. Having a basic knowledge of French and Spanish, he was able in six weeks' time to absorb the Portuguese language sufficiently to conduct his lectures to the Brazilian officers in their native tongue. During his two years' service in Brazil as Naval Commissioner in the Diplomatic Service, he was instrumental in planting the first seeds of friendship between that country and the United States. As a mark of esteem for his excellent service the Brazilian Government sent a special envoy to place a plaque in the Mahan Library at Annapolis, in his honor. Admiral Vogelgesang was detached as Chief of the Naval Mission to Brazil and returned to duty at Naval Operations, Navy Department, Washington. D.C., January, 1925. In April, 1925, Admiral Vogelgesang assumed command of the Midshipman Summer Cruise with the USS New York as flagship, and came to the Pacific Coast. On his return from that cruise he was given command of the Fleet of Scout Cruisers, with USS Trenton as flagship. It was while on this duty that he passed away, February 16, 1927. He had so endeared himself to the Brazilian people that the entire Brazilian Legation was present at the burial services at Arlington. A year later, to commemorate the day, the Legation once more gathered there. In New York on August 3, 1944, work began at the Bethlehem Steel Corporation shipyard at Staten Island on a new Destroyer. It was christened the "USS Vogelgesang (DD-862)" January 15, 1945, by his daughter Zenaide, now Mrs. Walter Bradley of Houston, Texas, and commissioned April 28, 1945. The christening party included his widow and daughter-in-law, Mrs. Shepard Vogelgesang, Mrs. Gregory Davison, Mr. and Mrs. George Moulson, Barbara Jane Sullivan, Sp. T. 1/c USNR Lieutenant Bill Vogelgesang, USNR, and Lieut. Commander Woodson P. Vogelgesang, USNR, the last three named being on active duty with the Navy in that area. Theodore, whose story began in the little mining town of Petersburg, had become the first Californian to reach the rank of Flag Officer in the United States Navy. 2 May 1912 - tranferred to Wyoming (Battleship No. 32) to fit her out. When she was commisioned, he assumed duty as executive officer. 1917 - Chief of Staff to the Commander in Chief, Asiatic Fleet. Shortly after assuming this post, promoted to Captain, back-dated to 29 Aug 1916. Jan 1918 - reported to Rio de Janeiro, Brazil as senior officer of the American naval commission. 9 Jan 1919 - took charge of the fitting out of Idaho (Battleship No. 42) at Camden, NJ and assumed command when she was commisioned on 24 Mar 1919. Nov 1922 - received orders to organize and lead the U.S. Naval Mission to Brazil. For the next two years, he and his staff joined their Brazilian counterparts in reorganizing the Brazilian Navy. Early in this assignment, he was promoted to Rear Admiral, back-dated to 16 Oct 1922. Jan 1925 - completed mission in Brazil and returned to the U.S. on 7 Feb.
3 Apr 1925 - broke his flag in New York (BB-34) and became Commander, Battleship Division 2 of the Scouting Fleet. Jun 1926 - Commander, Light Cruiser Division, Scouting Fleet. This tour of duty was cut short when he entered the Naval Hospital, Washington, DC, for treatment of a kidney ailment. He died there on 16 Feb 1927. The Navy Cross is presented to Carl T. Vogelgesang, Captain, U.S. Navy, for exceptionally meritorious service in a duty of great responsibility as chief of staff to commander in chief, U. S. Asiatic Fleet. Posted: 9 December 2006 Updated: 8 April 2009 .